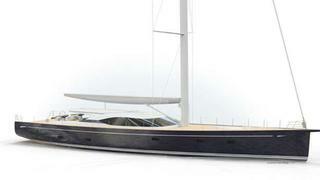 Oyster has announced plans to build a custom one-off sailing superyacht, the Oyster 115. Commissioned for an existing owner, the yacht is currently in development with Oyster Yachts and Humphreys Yacht Design. The Oyster 115 will be built to comply with MCA LY3 yacht code for charter, and she will offer accommodations for 10 to 14 guest with a master suite and four double guest staterooms aft, while a fifth guest stateroom set forward will accommodate children with foldaway bunk beds and convert to a TV room. A cabin opposite of this can serve as a captain's stateroom or supernumerary cabin. There are crew accommodations for six in total. The cockpit and upper saloon are on a single level, with the dining area set forward, one step down. The Oyster 115 features a sleek exterior with a low-slung cabin top, single headsail and swept-back spreader carbon rig. The yacht is to be built in UK and launch is planned for 2017.